Here are some interesting data about how many Spaniards who live in the relevant regions speak or just understand Galician, Basque, or Catalan. The Spanish government asks about language usage every time it does a national census. Unfortunately, it still hasn’t processed the language results from the most recent census (2011), so these numbers date from 2001. At that time, the regional languages were spoken by over half the residents of their respective territories: Basque by just over one-half of residents, Catalan by about two-thirds, and Galician by almost all. The lower numbers for Basque are to be expected because, unlike Galician and Catalan, Basque is unrelated to Castilian Spanish and therefore difficult for other Spaniards to learn. (This difference also explains the large numbers of Spaniards who can understand, though not speak, Galician and Catalan.) The higher numbers for Galician, compared to Catalan, are probably attributable to demography. As shown in the last column, over 90% of Galicians were born in Galicia, compared to less than 70% in the prosperous and cosmopolitan Catalan region. It will be interesting to see how the 2011 data compare. If you want to have a closer look at the numbers yourself, you can visit the Spanish census website. Previous posts on minority languages of Spain are here, here, here, and here. This entry was posted in Spanish in the world and tagged Basque, Catalan, Galician, minority languages of Spain, Spanish, Spanish census on 26 June, 2013 by jhochberg. When I was relatively new to Spanish, one of my teachers explained to our class that voseo was a special feature of Argentinian Spanish. Voseo is the use of vos, with its associated verb forms, instead of standard Spanish tú, as an informal pronoun meaning “you”. So “you speak” is vos hablás instead of tú hablas, “you are” is vos sos instead of tú eres, and so on. Years later I learned that voseo isn’t limited to Argentina, nor to its neighboring countries in South America. It’s found in several countries in South America, and also in parts of Central America, including El Salvador. (I seem to be running into a lot of vos-using salvadoreños lately, both at home and out of town.) 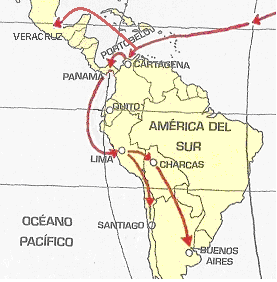 Below is a map showing where vos is used in Latin America. Reproduced by Creative Commons license. Medium (or dark) blue indicates spoken (and written) voseo. Light blue indicates tu/vos alternation. Grey indicates tú only. By the way, this is my second-favorite voseo map. My favorite is on p. 156 of Christopher Pountain’s Exploring the Spanish Language; do a “Search inside this book” with the phrase “distribution of voseo” to find it. It’s under copyright so I can’t reproduce it here. As you can see in either map, the distribution of voseo doesn’t tidily follow country borders, or even continental borders. The controlling factor is, rather, historical. As I explained in my very first post on this blog, travel between Spain and Latin American was restricted during the colonial period because of rampant piracy on the Atlantic Ocean. Therefore, settlements close to the two colonial capitals of Mexico City and Lima, or to the major ports of call en route such as Veracruz and Portobelo, had much more exposure to the latest linguistic developments from Spain than those in the “boondocks”. For your convenience, here is the map of colonial trade routes I included in that first post. Voseo is a perfect illustration of this phenomenon. At the beginning of the Colonial period, tú and vos were both current in Spain. Eventually, of course, tú won, but only those parts of Latin American that were in regular contact with Spain followed its lead. That’s why, if you compare the two maps, the all-tú areas (grey on the voseo map) roughly correspond to the colonial trade routes (red on the second map). Argentina was about as boondock-y as you could get since it could only be reached by crossing the Andes, by foot and/or by mule, from Lima. That’s why its voseo is the strongest in the continent. This entry was posted in Latin American Spanish, Nouns and pronouns and tagged Argentina, Latin America, Spanish, voseo on 23 June, 2013 by jhochberg. Muchas de mis nuevas conocidas eran salvadoreñas y tuve varias conversaciones interesantes con ellas sobre el voseo en El Salvador. Una niñera me explicó con muchos detalles con quiénes se usan tú, vos, y usted, las situaciones y las implicaciones sociológicas. Después pensé en lo improbable que sería tener una tal conversación sobre el inglés. No solo de mi parte (la verdad es que no me interesa mucho mi propio idioma), sino porque creo que a los hispanohablantes les importa más su idioma que a los angloparlantes. El vocabulario inglés (“coke” versus “soda” versus “pop”) sí discutiríamos, pero ¿la gramática? ¿LOS PRONOMBRES? ¡Ni posibilidad! Pero en español, sí. El idioma es una parte fundamental de la identidad hispana y apasiona a la gente normal, no solo a los lingüistas. Esto les da un elemento de emoción a mis investigaciones sobre el español y a mi enseñanza que les faltaría en inglés. Many of my new acquaintances were from El Salvador and I had various interesting conversations with them about voseo (the informal word for “you”) in their country. One babysitter explained to me with great detail when it is appropriate to use tú, vos, and usted, and their various sociological implications. Afterwards, I thought of how unlikely it would be to have a similar conversation about English. Not just because of my own inclinations (I’m not that into my own language), but because I believe that Spanish speakers care more about their language than English speakers do. One might talk about English vocabulary (e.g. “coke” vs. “Soda” vs. “pop”), but — grammar? PRONOUNS? No way! But in Spanish, yes. Language is a fundamental part of Hispanic identity that sparks passion in normal people, not just linguists. This imparts an element of emotion to my research and my teaching that would be lacking in English. This entry was posted in Latin American Spanish, Nouns and pronouns, Spanish Friday and tagged El Salvador, linguistic identity, pronouns, Spanish, voseo on 21 June, 2013 by jhochberg. You may have already seen this video, but in case you haven’t, enjoy. This entry was posted in Latin American Spanish, Learning Spanish and tagged jerga, Spanish, Spanish slang on 19 June, 2013 by jhochberg. This post is a little denser on grammar than usual, so I’ve inset helpful expositions in red. The American comedian W.C. Fields famously quipped that if first prize was a week in Philadelphia, second prize was two weeks. I suppose that most Spanish students feel the same way about the subjunctive. If first prize is the present subjunctive, second prize is the imperfect subjunctive. Third prize, then, must be the present subjunctive plus TWO imperfect subjunctives: the ones with -ra and the ones with -se. For a linguist, however, the many subjunctives of Spanish are pure candy. For one thing, it’s delightfully contrarian that neither imperfect subjunctive is directly related to the original Latin version. Instead, these two tenses (or moods, more precisely) arose from two Latin pluperfect conjugations: the pluperfect subjunctive (for -se) and the pluperfect indicative (for –ra). “Pluperfect” simply means a tense that is used to talk about actions completed before some past point in time. The Modern Spanish equivalents use compound structures, as in Si hubiera comido… “If I had eaten…” (pluperfect subjunctive) and Había comido “I had eaten” (pluperfect indicative). The following table shows the original Latin conjugations and their outcome in Spanish. Essentially, what we are seeing here is a snapshot of a slowly moving change in the language. The -se subjunctive came first; Ralph Penny dates it to Old Spanish, roughly 1000 to 1400 CE. Its evolution was relatively simple, involving only a shift in time (from pluperfect to normal past tense) along with shortened verb endings as a result of normal sound change. The -ra subjunctive took longer to evolve because it also involved a switch from indicative to subjunctive: that is, from actuality to possibility. Penny dates its emergence to the Golden Age (1500 to 1700), and its overtaking the -se subjunctive to “more recent times”. In the Spanish imperfect subjunctive, then, the language’s past and future co-exist peacefully in the present. Although this is an unusual situation in grammar, it’s one that we’re used to in vocabulary, which changes much faster. A contemporary American English speaker, for example, understands the outdated swell and nifty, the timeless cool, and possibly the trendy swag and dope. The Spanish parallels would depend on dialect, but just consider the exuberant redundancy of maravilloso, fantástico, estupendo, fabuloso, excelente, fenomenal, tremendo, and buenísimo. The co-existence of the two Spanish subjunctives is therefore simultaneously exotic and familiar. This entry was posted in From Latin to Spanish, Verbs and tagged -ra imperfect, -se imperfect, imperfect subjunctive, Latin, Spanish, subjunctive, verbs on 18 June, 2013 by jhochberg. Ver es creer (“Seeing is believing”). In Old Spanish — the Spanish of El Cid, spoken into the 1400s — ver and creer had more in common than this refrán. The Old Spanish version of ver was veer, and its conjugation was identical to that of creer (and likewise leer). Although I didn’t bother to include it in the table above, poseer, from Latin possidēre, fits the same pattern. Ver‘s history is both unique and familiar. Unique, because it created the only verb with this specific irregularity. (I’m not counting prever, which is of course based on ver.) Familiar, because as with the much more frequent -zco and -go verbs, the more conservative yo form, ironically, became irregular as a side-effect of changes that affected other forms of the verb, including the infinitive. Veo itself would have remained just as regular as creo and leo if the other verb forms hadn’t changed. So, dear reader: Viste. Leíste. ¿Creíste? This entry was posted in From Latin to Spanish, Verbs and tagged irregular verbs, Latin, Spanish, veo, ver, verbs on 11 June, 2013 by jhochberg. Irregular yo in Spanish — NOT! 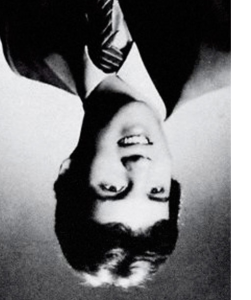 Because my high school friend Peter was on the yearbook committee, he managed to have his picture published upside-down (that’s NOT him in the picture below), with the senior quote “Maybe, just maybe, everyone else is wrong”. Believe it or not, I thought of Peter immediately when I looked into the origin of the two biggest Spanish verb groups with irregular yo forms in the present tense: the so-called -zco and -go verbs. (This is particularly ironic because Peter didn’t even take Spanish.) It turns out that from a historical perspective, the yo forms are actually the most REGULAR — that is, most faithful to the original Latin. In a nutshell, their -o ending insulated them from sound changes that affected /k/ before /e/ and /i/; i.e. before front vowels. So in this case, everyone else IS wrong, or at least linguistically radical. For -zco verbs like florecer, from Latin florescere, the relevant change was the simplification of /sk/ to /s/ (in Andalucian and Latin American Spanish) or /Θ/ (in Castilian Spanish) before /e/ or /i/. [Note: this is a drastic abbreviation of a process that involved several intermediate steps; see Ralph Penny’s A History of the Spanish Language or another good history of Spanish for details.] So the infinitive changed from florescere to florecer, the tú form from floresces to floreces, and so on. Only florezco kept the /k/ cluster of the original Latin. For -go verbs like hacer, from Latin facere, the relevant change was the fronting and softening of /k/ to /s/ or /θ/ before front vowels. So the infinitive changed from facere (with a /k/ sound) to hacer, the tú form to haces, and so on. Only haco remained in the present tense as a reflection of the original Latin /k/. Later, a separate change voiced the /k/ to /g/, giving us modern hago. (This /g/ is still a lot closer to /k/ than is /s/ or /θ/.) A similar sequence of events impacted Latin dicere as it evolved into decir, giving us the (yo) digo form. All the sound changes mentioned above were general, occurring throughout Spanish vocabulary. For example, the /sk/ simplification gave us pez (from Latin pesce), /k/ fronting gave us cielo (from Latin caelu), and /k/ voicing gave us lugar (from Latin locale). The change of /f/ to /h/ in hacer (from facere) is also seen in words like hijo (from Latin filius). As I described in an earlier post, analogy untidies the results of sweeping sound changes like these. This was certainly the case with the -zco and -go verbs. The verb lucir and related verbs like deslucir adopted the -zco pattern, as did several verbs ending in -ducir, such as producir, even though none of these had an /sk/ cluster in Latin. Likewise, the -go pattern spread to other common verbs including venir, tener, and salir, though at the same time, some verbs originally in the -go group became regular (cocer is one). After these back-and-forths, modern Spanish ended up with almost 100 –zco verbs, and around 10 –go verbs. You can check my Teaching page for a full list of the -zco verbs. The other irregular yo types — ver, the -oy verbs, and the two -e verbs (haber and saber) –are another story entirely; maybe I’ll post about them later. This entry was posted in From Latin to Spanish, Verbs and tagged analogical change, go verbs, irregular verbs, irregular yo, Latin, sound change, Spanish, verbs, zco verbs on 6 June, 2013 by jhochberg. As much as I love Spanish, there have been a few periods in my life when I didn’t speak it much, or at all. Because I’m a compulsively analytic linguist, it’s been interesting to see what I’ve forgotten, or remembered, after a break from the language. My longest break was the dozen or so years that I worked as a computational linguist. For most of this time I lived in New Mexico, where, as I previously described, it was hard to find people to speak Spanish with because I was an outsider — an Anglo (or Angla). What did I forget during that time? Mostly, vocabulary, on what a computer scientist would call a LIFO basis — Last In, First Out. That is, the words I forgot tended to be the ones I’d learned most recently. I discovered one such loss when my husband’s cousin came to dinner with his family. His wife Claudia is Mexican and it was pure joy to speak Spanish with her and their multilingual children (Spanish, French, some Hebrew, some English). At one point I groped for the word for “struggle” and came up with esdrújulo. Claudia looked puzzled. Clearly the word didn’t mean what I thought it did; in fact, she told me she had never heard it! A trip to the dictionary solved the mystery: esdrújulo is a reasonably obscure linguistic term that I had learned while writing my dissertation on children’s acquisition of the Spanish word stress system. It refers to stress three syllables from the end of a word — the antepenultimate syllable. Some examples are teléfono, helicóptero, and, of course, esdrújulo itself, which means that the word is “autological“, i.e. an example of what it defines. (Sesquipedalian, meaning “having many syllables”, is another famous autology.) Esdrújulo and struggle are phonetically similar: sdru maps to stru, j maps to g, and l maps to l. This undoubtedly explains why my memory had reinterpreted the word during those years of disuse. Needless to say, I have never since forgotten it! I retained Spanish grammar more completely, which again makes sense for a linguist. Grammar is our bread and butter, the pond we choose to swim in. In fact, when I decided to make a career transition to teaching Spanish, and spent some time in Mexico refreshing my skills, I found that the only significant chunk of grammar I’d forgotten was the use of the subjunctive after expressions of emotion, as in Me alegro de que Pablo ESTÉ aquí (I’m happy Pablo’s here). It’s an odd usage, when you think about it, because there’s no doubt about Pablo’s location; compare, for example, Espero que Pablo ESTÉ aquí (I hope Pablo’s here). Losing and recovering this use of the subjunctive has made me more sensitive, as a teacher, to the challenge it poses for students. 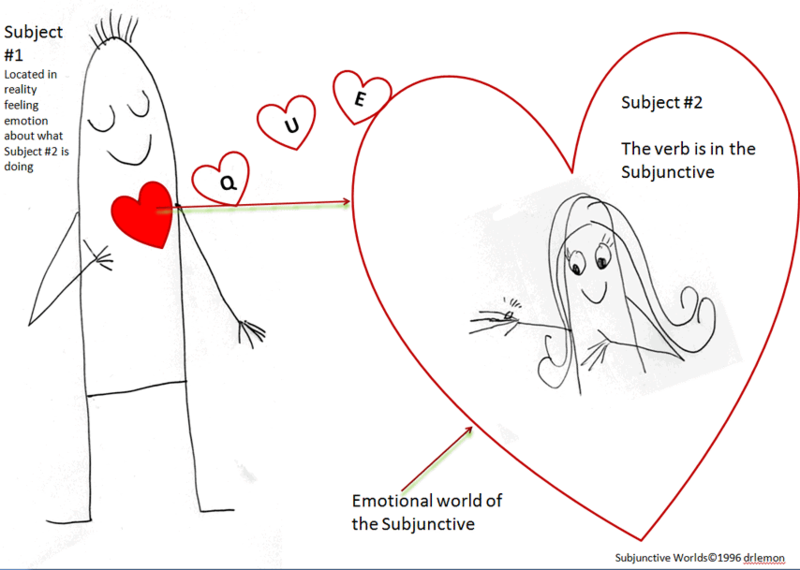 How cute is this cartoon about the subjunctive, from drlemon.com? If losing a bit of Spanish is frustrating, there’s pure joy in having one come back to you. As a college student I put Spanish on the back burner for a few semesters to work on my French, then spent a summer in Madrid. I’ll never forget the day our group was walking down a street and stopped to admire a beautiful tile. Like a long-lost friend, the word azulejo floated into my active memory after a few scary moments of mental groping. It felt like a divine signal from the Spanish gods, if you will, that they’d forgiven my temporary apostasy. Since then, azulejo has been one of my favorite Spanish words (along with esdrújulo, I guess). Many people assume it comes from the word azul, since so many tiles are blue, but the Real Academia assures us that it comes from Arabic azzuláyga. It’s a gorgeous word no matter where it comes from. This entry was posted in Learning Spanish and tagged Arabic, autological, autology, azulejo, esdrújulo, Spanish on 5 June, 2013 by jhochberg. “Spanish” does not refer to any linguistic reality, it’s an adjective used to deny identity since the planting of geopolitical colonial cultures opposed to free linguistic cultures. In Spain, by law, the official language is CASTELLANO, Castilian in Engish…There are various Castilians. [Some] examples: Castilian from river Plate, Castilian from the Pacific, Castilian from the Caribbean, Castilian from USA. So could you please explain [why one should] maintain the wrong linguistic name in South America, Caribbean and North America for that language? What [is] the impediment to recognize something that breaks stereotypes and may teach some people, at least the proper name of their linguistic identity? I appreciate this visitor’s taking the time to visit my blog and leave a comment. She expressed a perspective that I wasn’t familiar with. And as a native speaker (she’s Argentinian) she certainly has more “standing” on this issue than I do. To some extent, this visitor was preaching to the choir. When I speak Spanish I often say castellano instead of español. This is partly because it’s normal usage, and partly because I love the reality that, as the commenter also mentioned, “siete idiomas se hablan en España y son todos ‘españoles'” (“7 languages are spoken in Spain and all of them are ‘Spanish'”). However, I disagree with her comment on several counts. First, if one objects to “Spanish” on anti-colonial grounds, how is “Castilian” any better? The term “Castellano” or “Castilian” comes from the Castilian region of Spain, after all. If a Québécois were to resent France, would it make him any happier if the French language were called “Parisian”? Second, it’s a hard, cold fact that language names come from country names. Should these be reconsidered whenever a country has engaged in colonial behavior in the past? Should we look for a geographically neutral name for Portuguese? For English? As a red-blooded American I’m proud to speak “English”, and embrace the entire history of my own amazing language, warts and all. Finally, in the specific case of “Spanish”, even if the commenter were 100% in the right, the word is too entrenched in the English language to be changed. We have Spanish dictionaries, classes, departments, linguists 🙂 and so on. Trying to change this would be…well, like tilting at windmills. Please keep the comments coming! My blog is still relatively new, and I do hope that many people will participate. 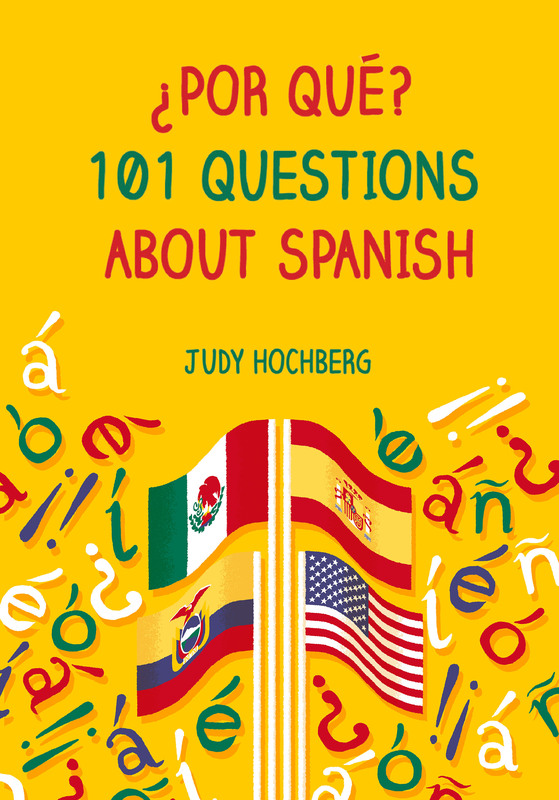 This entry was posted in Spanish in the world and tagged Spanish on 2 June, 2013 by jhochberg.